Written by Pamela Collins, Aaron Dembski-Bowden, Jonathan McFarland and Morgan A. McLaughlin with artwork provided by Sam Araya, Durwin Talon, Avery Butterworth, Michael Gaydos, Travis Ingram and James Cole, World of Darkness: Antagonists is a sleek, thin hardcover that offers both players and Storytellers a good look at three “generic” types of foils – the walking dead, mortal hunters, and organized (or not so organized) religious threats – as well as a toolbox for the generation of home-cooked antagonists to fit the needs of any chronicle, limited entirely by the imagination of the ST. While World of Darkness: Antagonists is written in a voice that speaks very directly to the ST, the book is most certainly a boon for the player who wants to give their character a nice, solid history and “flesh out” some of their Merits… in the case that you’ve got an Ally out there who happens to be a freelance witch-hunter, that is… and therefore works out a place for itself on both ST and player bookshelves. Chapter One: The Living Dead is probably my favorite chapter of the book if for nothing else than the sheer variety that it offers up for antagonistic baddies that are both disposable and challenging. The chapter covers three distinct categories of the living dead: zombies, imbued and revenants. Zombies, in and of themselves, have a couple of different subdivisions that are mentioned in the chapter. You can have the voodoo zombie that is created through ceremony and ritual, or you can have the classic, carnivorous shambler of the Romero movies, etc. Imbued antagonists, i.e. golems or possessed toys as examples, are created from once living parts of other things. Movies like the pseudo-cult classic May or, if you need something a little more freaky, the entirety of the Child’s Play series lend some inspiration towards this sort of antagonist. Finally, there are revenants, that are essentially the undead that are possessed by their own spirit – ergo, Eric Draven from The Crow – or are possessed by a more malignant spirit, sort of like a post-mortem demon possession, if you will. This chapter is put together great and flows like water. If you need something to challenge your PCs, then throw them up against a would-be voodoun priestess who can summon a dozen or so zombies to her defense or to make her will manifest. If your players got a little crazy one night and took down a couple of way too innocent people who were just in the wrong place at the wrong time, then bring one of them back as a revenant to haunt them for a little while and make them a little more concious of their Morality scores. There’s a bunch of new Aspects, Weaknesses, Powers and a handful of really interesting NPCs ready to use towards the end of the chapter. Good stuff. Chapter Two: A Need for Vengeance covers mortal hunters of the supernatural. As the chapter points out, these antagonists are the enemies that your characters have created. That being the truth, mortal hunters in the World of Darkness are by far and away some of the most potentially devastating antagonists that you can add into your chronicles. One of the things that I really like about this chapter of the book is the fact that these hunters are not at all the Hunter: The Reckoning hunters that left such a foul taste in my mouth a few years back. These hunters rely on grit, garlic and gunpowder to do their dirty work, and not a whole lot more, save courage. Also, it has pretty much everything necessary to run a hunters’ game in the World of Darkness, with the exception of the core rules, and make for a really interesting set of games all their own. The Storyteller section offers up a ton of valuable information for this exact reason. 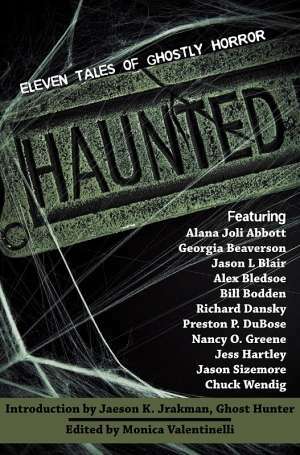 A host of sample hunters are included in this chapter, and while it probably is not the only resource we’re going to see covering this subject in the World of Darkness, it’s a heck of a start. Chapter Three: The Righteous and the Wicked takes a look at the threat posed by religious orders in the World of Darkness to the PCs of your chronicle. The chapter covers mainstream religion and its power within the soceities as per the World of Darkness, as well as the more sinister and potentially more dangerous threats represented by cults and cultists that follow darker paths of enlightenment. Imagine the threat that could be posed to a group of vampires by a cult that sees vampire blood as the opiate of the gods. What sort of problems could a fundamentalist cult of puritanical zealots cause a group of awakened mages in Boston? “Thou shalt not suffer a witch to live” takes on some pretty heavy inflection. In a world where there is vastly more shadow than light, religion is a powerful bastion of protection and hope for the average person. With the right motivation and under the charismatic sway of the right person, a religious sect can cause a whole world of hurt to fall down on any one of the three major supernatural factions within the World of Darkness. A handful of sample cultists and religous figures as well as a few examples of cults are provided. Persephone Unbound is one of the more interesting concepts in the chapter – just to pick one – representing a group that can serve as both an enemy as well as a group of potentially formidible allies that could potentially use the living dead AND hunters from the previous two chapters to assist them in their goals. Chapter Four: Fear Given Form is kind of like part catch-all chapter and do-it-yourself toolbox for creating antagonists when the previous three chapters might not have offered you what you need, be you a player or a ST. This is the chapter for creating monsters to do battle with monsters. While vampires and mages may rule the cities of the World of Darkness, and werewolves hold their own territory with iron claws pretty much anywhere they like, the World of Darkness is a big place. Vampires and mages and werewolves are few. They aren’t everywhere at all times, and there are places in the world where other things hold power and court, where other things rule and destroy all that attempt to cross them. The chapter offers up a few example monsters – some pretty goofy, while others interesting – and steers clear, for the most part, of things like the Jersey Devil or Sasquatch, (which I think is both good and bad, as we’ll see what comes later) and affords them powers and stats for use in your games right away should you choose. I would have liked to see something a little more along the lines of a “monster generator” here with some conceptualization tools and maybe even a step-by-step guide that works in tandem with the core rulebook’s character creation system. I think that something along those lines would have been a whole lot more useful than the writeups on “The Virus” or the prehistoric killer fish… but that’s just me. All in all, I think that Chapter Four kind of weighs the book down a little when compared to the really interesting information and presentation of the first three chapters, and it kind of ends the book on a bit of a metiocre note, but again, that’s simply my opinion. 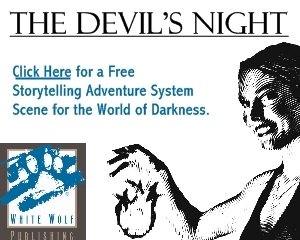 As a whole, I think that World of Darkness: Antagonists does exactly what it sets out to do: present a book of resources and story seeds that can be used throughout the whole of the World of Darkness game system as it stands right now without bias. There’s a whole mess of valuable information and ready-to-use stuff, and realistically, with a copy of the World of Darkness core rules, you’ve got all you need to get started with a group of mortal vampire hunters, cultists searching for the elixir of immortal life, or a bunch of folks trapped in a mall by brain-hungry zombies. Not a must have book, but definitely handy for something different or to add a generic “big bad” to your own World of Darkness.